Appearing as the first of two new U.S. Mint releases this month, the 2018-W $50 Uncirculated American Gold Eagle launched today at noon Eastern. Each coin is struck from 1 ounce of 22-karat gold. Each Gold Eagle is encapsulated for protection and mounted in a burgundy presentation case. A U.S. Mint Certificate of Authenticity is also included. This year’s uncirculated Gold Eagle has a limited mintage of 10,000. Recent annual versions were offered without mintage limits. Pricing for the coin is $1,590.00. That is subject to change weekly, however, based on the Mint’s precious metal coin pricing matrix. The U.S. Mint introduced the annual collector coin in 2006. 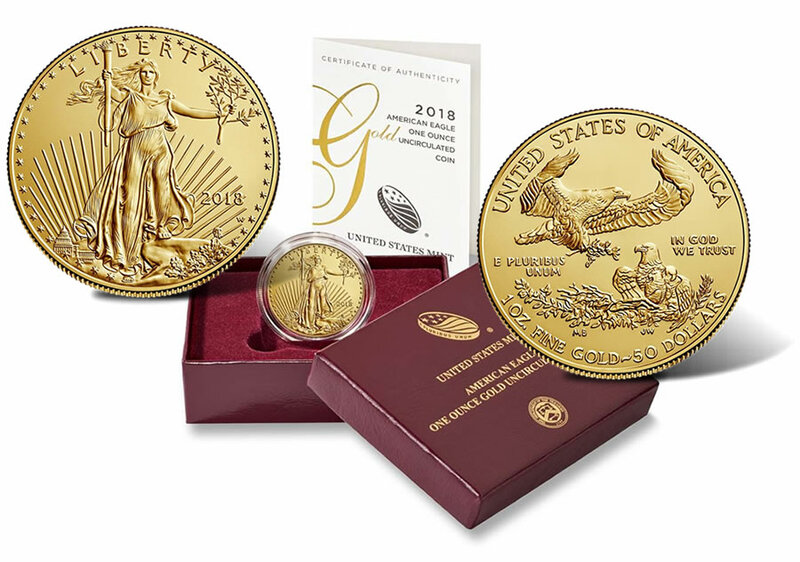 It bears the same designs as on the related American Eagle gold proof and bullion coins but is featured in an uncirculated finish, giving it a different appearance thanks to the use of burnished coin blanks and special coin dies. Gracing the obverse (heads side) of each coin is a design by Augustus Saint-Gaudens. It is considered by many to be one of the most beautiful to ever appear on coinage and was first used on 1907-1933 $20 Double Eagles. The design depicts a full length Lady Liberty with flowing hair. A torch can be seen in her right hand with an olive branch in her left. Obverse inscriptions read LIBERTY and 2018. In addition, a ‘W’ mintmark indicates its production at the U.S. Mint’s facility in West Point, New York. Miley Busiek designed the unique reverse. It shows a male eagle flying above a nest while carrying an olive branch. In the nest, we find a female eagle and her hatchlings. Reverse inscriptions read UNITED STATES OF AMERICA, IN GOD WE TRUST, E PLURIBUS UNUM and the specifications of 1 OZ. FINE GOLD and 50 DOLLARS. Sales of uncirculated coins are generally quite low in comparison to proof and bullion editions. This serves as a drawing point for some collectors looking for that low mintage. For the record, the 2017 uncirculated American Gold Eagle finished with final unaudited sales of 5,800 — a new low for the series — while the one from 2016 ended at 6,887. The U.S. Mint released uncirculated Gold Eagles in 1/10 oz., 1/2 oz., 1/2 oz. and 1 oz. sizes in years 2006 to 2008. The coin program was suspended in 2009 and 2010. The series resumed in 2011 as an annual offering with the 1 oz. size. 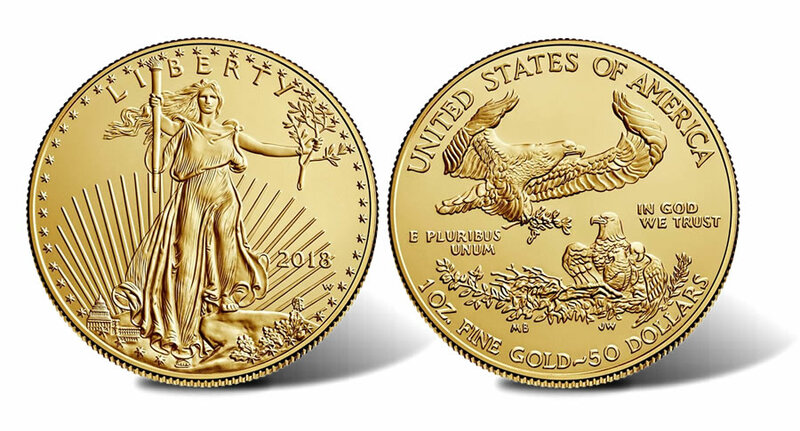 The 2018-W $50 Uncirculated American Gold Eagles may be ordered directly from the U.S. Mint’s website page dedicated to gold coins, located here, or by calling 1-800-USA-MINT (872-6468). There are no household ordering limits. Up next for the Mint this month, the 2018 San Francisco Mint Silver Reverse Proof Set will debut on July 23 for $54.95. Its mintage limit is 200,000 and there is an initial household order limit of 10 sets. How can the Mint do this… only $350 over spot…hard to belive they can keep the premium sooo low……. what next 2019 Proof ASE running $99.95? YOUR VERIFICATION THING IS RIDICULOUS, how many bogus posters on a COIN Collecting site? yeah discourage people more….. I placed my order for the 2018 gold burnished coin the minute they went on sale now they are telling me it will be October before I get it sounds like the mint is pulling off another fast one never seen this happen before —-any comments? I ordered it on 8/29 while being told it was on back order till 11/6. In three days it indicated it was in process and received it in a week. Very nice Coin. Looks like the Mint is not planning well for a newly-issued coin for sure. The backorder date is August 8. They didn’t plan production well !